Cheese made from goat milk is among the oldest and most popular cheese in the world. They are varied in taste and versatile in use. 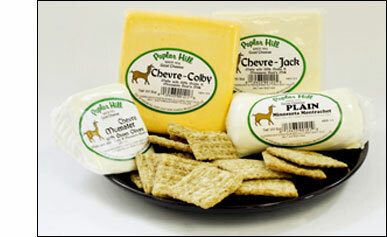 Poplar Hill has been selling goat cheese and Grade A goat milk for many years. Our goat cheese is available in 5 varieties. 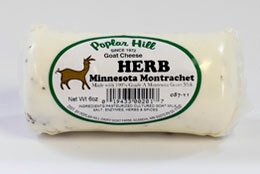 We offer two styles of fresh, soft goat cheese, Minnesota Montrachetand Minnesota Montrachet with herbs. . Fresh cheeses are those which have not been aged. They are soft and creamy, enjoyable eaten by themselves or added to a wide variety of dishes for new taste and flair. We also offer 7 styles of our goat cheese that are firmer and more traditionally American - Chevre Jack, Cherve Muenster and Cherve Muenster with Green Olives. 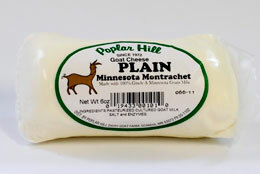 AWARD WINNING - Minnesota Montrachet - Poplar Hill Goat's Milk cheese 2nd Place at 2011 MN State Fair - Artisan Cheese division! 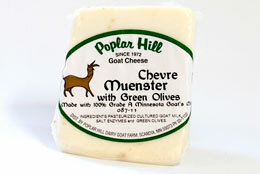 This is a soft and moist chevre (pronounced shev) made in the finest French tradition with Minnesota freshness. As white in color as the quality milk from which it is produced, Minnesota Montrachet is considered by many to be one of the best of the mildly tart, fresh chevres. Our same fine fresh chevre with the added touch of flavorful sweet basil. 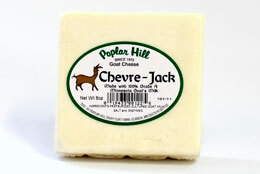 Styled after Monterey cheese, a cow milk cheese originally from California that has enjoyed over ninety years of popularity, our Chevre Jack is moister and smoother in texture than our Chevre Colby, and near white in color. It is sweeter and milder when young and gets sharper with age. This is a favorite at the wine and cheese events that we attend. If you love olives, this cheese is a must have.